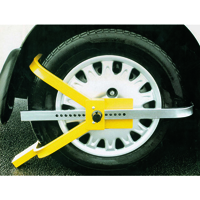 Used to deter thieves and wrongdoers, a wheel clamp is a shrewd investment that could also help reduce your insurance premium. 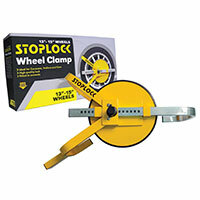 Find your next wheel clamp in the range below! Here at Euro Car Parts, you’ll be sure to find a wheel clamp to suit your specific needs, whether you’re looking to protect a smaller vehicle like a Mini Cooper, or a larger, more robust motor like a Ford Transit van. All the wheel clamps stocked throughout the range are manufactured by some of the most trustworthy names in the business, names like Autocare, Stoplock and Streetwize. This means you won’t be lumbered with a product that breaks as soon as you get it out of the box - instead, you’ll get a wheel clamp that’s durable, weatherproof and great value for money. Interested to find out more or have a specific question about your order? Call the team today on 0203 788 7842. Lines are open Mon-Fri 09:00-20:00, and Saturdays until 17:00 - we look forward to hearing from you. Free UK delivery is available across the range, while click and collect provides a great option for those that need their clamp the same day as ordering.